Walk the paths, and you can almost see them. Climb the hills, and they seem to climb with you. It may be quiet now, here, in this little town in south-central Pennsylvania. The guns no longer thunder. The battle flags no longer wave. The shouts, the shots, even the screams have long since died into silence. But call the roll, and you can almost hear them answer. Major Alonzo Cushing, 4th United States Artillery. Here. Private James T. Womble, 5th North Carolina. Here. Private George Washington Sandoe, 21st Pennsylvania Cavalry. Here. Private Samuel Rhodes, 33rd Virginia Infantry. Here. Corporal Cyrus W. James, 9th New York Cavalry. Here. Sergeant W.G. Ray, 6th North Carolina. Here. Captain Nathan S. Messick, 1st Minnesota Infantry. Here. Corporal J.H. Walker, 57th North Carolina Infantry. Here. Private George Nixon, 73rd Ohio Infantry. Here. More than 50,000 in all. North and South. Union and Confederate. Blue and Grey. Gone. All gone. They answered that final call 150 years ago, during or of wounds received in the three days of the Battle of Gettysburg. The first through the third of July, 1863. One of the most moving moments of my life was walking through Gettysburg at about 6:00 a.m. It was quiet and the dew was thick on the grass. I could almost feel the ghosts there with me. Unbelievable experience. It is a humbling and awe-inspiring experience to walk those hallowed grounds, Debi. My feelings matched yours, for sure. 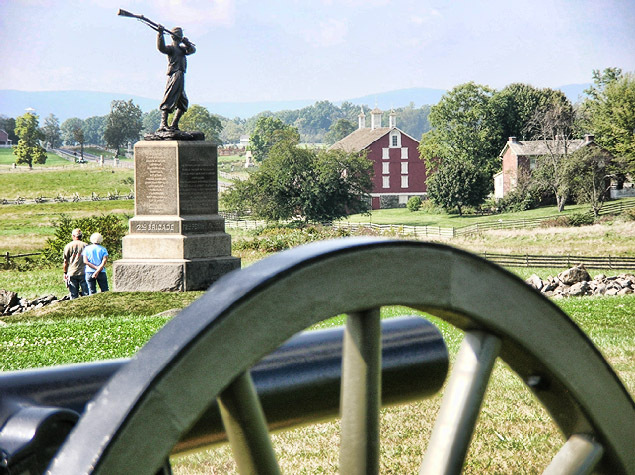 Try the Segway tours at Gettysburg. There are two tours that are absolutely marvelous. And they come with park certified guides, which is a plus. I imagine that they are booked full this weekend. Wish I was there. Definitely on my bucket list, Craig! Thanks for the reminder. At the end of a long day of exploring the battlefield, my companions and I stepped out onto the rooftop terrace of the building housing the cyclorama. From there we could see all the way across the valley where Pickett’s men had charged, only to be turned back almost at the place where we stood. 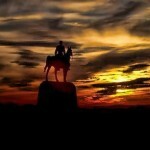 Below us, a bronze statue of Gen. Meade on horseback faced away towards the other side of the valley where, silhouetted against the setting sun, a similar statue of Gen. Lee, surrounded by the men of Virginia with their rifles at the ready, stood returning Meade’s gaze. Just as I began to wonder about the thoughts that must have run through the minds of the two generals as they assessed each other’s positions and tried to guess each other’s plans, I felt someone approach and stand quietly as if looking over my right shoulder. You must know the feeling I mean – sounds from behind were momentarily muffled and I felt that small disruption of gravity which indicates another body has moved very close. But on this occasion, when I turned around, no one was there. My companions had already gone inside and I was alone on an empty terrace as the presence receded into thin air. That’s one of the best descriptions of the feeling one can get in a place like that I’ve ever read. Thank you for the compliment, but it is my Celtic ancestors who deserve the credit for the both the intensity of the feeling and any ability to describe it. From one seanachie to another, then, kudos to the ancestors. 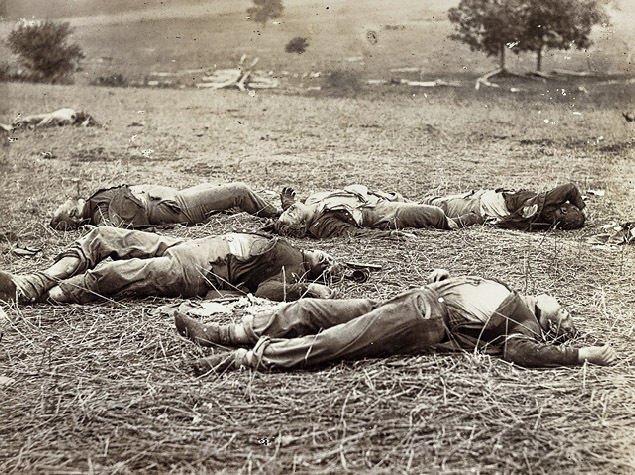 The statistics for Gettysburg dead are wrong. They are for total casualties (Killed, wounded, missing and captured) not just for the killed. Yes, I know it’s army site, still it is wrong. That was a breathtaking post, Judy. I read it three times. My mother’s grandfather was standing in defense of Harrisburg during the battle, and part of the clean-up in Gettysburg afterward. I’ve tried to imagine the smells of the dead, horses and men, during those days. He was still there when Lincoln came by to give that little speech. I had never heard these numbers, compared to Vietnam, Korea, and World War I. What terrible slaughter. Someone just bought for me Ken Burns’ documentary on the Civil War. That will help me understand. that must mean that 10% of the people killed in the Civil War were killed at Gettysburg. The numbers are high, Mariann — turns out that the Army’s figures are for all casualties: killed, wounded and missing, not just killed.